The following table list down both system specs for easy comparison. From there, you can see the major boost in upgrade is the amount of RAM, the CPU and finally both GPU and VRAM. While I do have SSD for the new workstation, I only use it as disk cache for Nuke. The Nuke installation is on regular 7200RPM mechanical HDD. 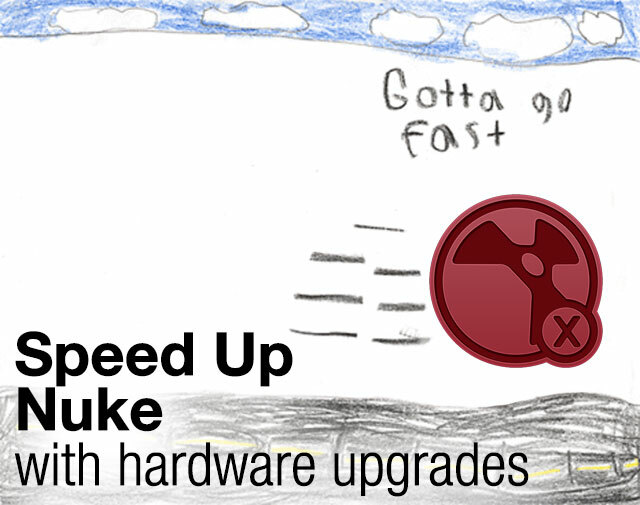 If you looking to quickly improve your turnaround iterations in Nuke, upgrade the RAM capacity. This is easily the best upgrade any Nuke users can benefit as Nuke eat up every single RAM that you can throw to it for caching purposes. As Nuke caches to RAM, it means it can reuse it quickly instead of streaming in from the HDD which is really slow especially when Nuke need to read in several image sequences from the HDD. I’m unsure if the speed of the RAM affects the Nuke performance significantly but capacity do make a huge difference if you comp at least 1080p resolution or higher. That doesn’t mean lower resolution like 720p means you can get away with lower RAM capacity. If you have a lot of elements to be comp in your script, it will easily use up all the available RAM. The jump from 8GB to 32GB of RAM allows me to also run Photoshop and Nuke together too without starving either software of RAM. Bottom-line: If you have spare RAM slots and still haven’t max out your motherboard total RAM capacity, RAM upgrades is best thing ever since sliced bread for Nuke. If you going to do lots of retiming, scanline render and camera tracker, you will want a CPU with lots of core and high clockspeed. There is still a huge amount of operations in Nuke that is still CPU bound so if you can afford it, get a dual CPU setup workstation as even on mine Intel Core i7 4770K (4 physical cores with total of 8 logical cores), Nuke is still bloody slow to me especially when dealing with scanline render. It will be a different story if you setup a render farm for Nuke as it will help a lot in speeding up CPU heavy scripts. This will increase your productivity as you spend less time waiting when iterating your compositing. Bottom-line: CPU upgrade can be tricky but if you planning for a new workstation, grab at least an Intel Core i7. Much better if you can go for the 6 cores or higher model or go the dual CPU socket configuration which uses Intel Xeon. For Intel Xeon, make sure to get at least quad core with hyper threading so you get a total of 16 threads at minimum. For AMD fans, look into Opteron series. Generally I steer away from AMD for the low CPU performance compared to Intel (although it is much cheaper). Long live AMD K6-2, Athlon and Athlon XP. Fast storage is another way to improve Nuke responsiveness as Nuke performs a large read and write operation to the disk cache be it rotoscoping or compositing job. SSD are already known for their faster I/O (Input/Output) speed compared to mechanical HDD so having your media and caches on is preferable if you can afford it. For me, I still put my media on HDD as the really large file size prohibited me from storing them on my current 120GB SSD. I haven’t try RAID (Redundant Array of Independent Disks) before but it is an alternative way to increase the throughput of both SSD and HDD by combining them in an array. Bottom-line: Faster and bigger storage space is always a big win for Nuke that is only limited by your casing and wallet.